Must Visit Northern Michigan Restaurants. 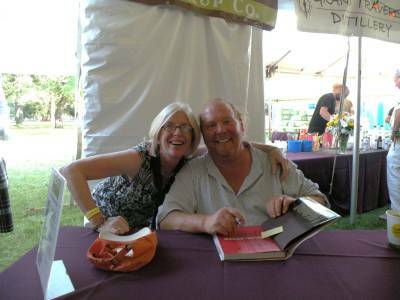 Northern Michigan restaurants served up Mario Batali's dishes at a Traverse City fundraiser. Here is Sue getting the "Iron Chef's" autograph on his newest book. An evening of good food and good fun. There are so many northern MI restaurants it would take a lifetime to visit them all. We want to show you those that you may not know about, but are definately worth your time to visit. A trip up-north isn't something that happens often but, every time I take a trip north, it seems my appetite goes into overdrive! Northern restaurants pride themselves on farm to table dishes. 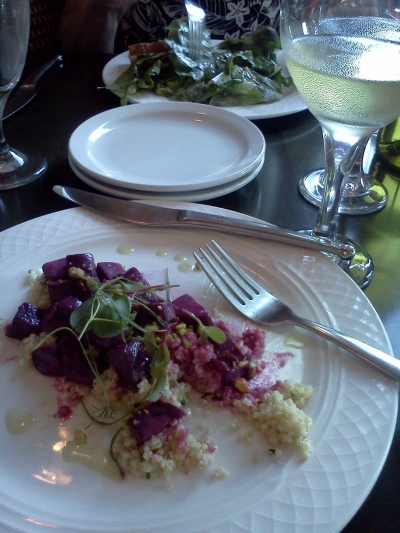 The Traverse Bay restaurants and Little Traverse Bay eateries are really plugged into the local farmers and fishermen. This guarantees you're always enjoying delicious dishes prepared with the freshest local ingredients. Here is our list of some northern Michigan restaurants you must try on your next trip. will want to do a breakfast here. The fact that you'll find many of the charter boat captains here in the morning is a sure sign of how good it is. Betsie Bay Inn is a place you'll love as soon as you walk in. This renovated, award winning inn and restaurant serves breakfast, lunch and dinner. You have to try the "Real Man's Quiche" for lunch. Art's Tavern is an institution in this charming town. This tavern was around before prohibition. A popular gathering spot that serves some of the best fish in the area. Be sure and try the whitefish dip and the whitefish burger. The Cove is located in Leland's historic "Fishtown". Their award winnig menu with Fishtown as a backdrop creates an unforgetable dining experience. When we're there you'll find us dining on the deck taking in the views. Martha's Table is a unique cafe/bistro open every day M-F for breakfast and lunch. Sunday they are open for the evening supper. Martha prides herself on a menu that features wonderful dishes prepared with locally grown ingredients. Grand Traverse Resort and Spa You expect world class dining at a world class resort and the Grand Traverse Resort and Spa is taht and more. The beautiful Aerie dinig room changes its menu seasonally to take advantsge of fresh local ingredients. This is fine dining at its best. You will be truly impressed! Park Place Hotel is located at 300 E. State Street (231-946-5000). The hotels Minervas Restaurant offers many affordable dining choices and options. Try their fabulous Sunday bruch ... you'll be glad you did! Scalawags Whitefish & Chips 303 E. State Street (231-933-8700) is where I'm going for fish. They are true to their motto "Hooked on Freshness". They also have a restaurant in Petoskey at 2266 M-119. Bower's Harbor Inn is one of the top northern Michigan restaurants and another must visit. This 1880s inn sits nestled among majestic oaks and pines of Old Mission Peninsula. This is the perfect setting for that special romantic dinner. Save room for their Brioche Bread Pudding. P.S. They say it's haunted ...we warned you! Chandlers Restaurant in Petosky MI Gaslight District is extremely popular with locals and travelers alike. If you enjoy elegant cuisine and impeccable service you must visit Chandlers. An extensive wine list featuring local as well as the top imports. Back to Romantic Lake Michigan home page.